If there’s one thing that’s in short commodity out here in the North East when it comes to Mexican food, it’s consistency. A place that is good one week seems to be terrible the next. So a restaurant or taqueria that can consistenly turn out great tacos, month after month, year after year, is a real treasure. Which is why, of all the tacos places I’ve tried in the NY Metro area, Tortilleria Los Gemelos in Port Chester is the one I’ve been going back to most consistently since I first tried it back in 2002. I’ve seen this place go through a lot of changes. At first – when it was named Tortilleria El Paisano (if I remember correctly) – it was just a bare-bones tortilla factory with tables and chairs that served basic taqueria food. The walls were white and bare and the ceiling looked like an old factory ceiling. Slowly they’ve transformed – painting the walls a festive color, redoing the ceiling, changing the name, expanding their menu, redesigning the seating to have permanent booths (which, by the way, are the most uncomfortable booths known to man). They’ve gotten a little more expensive, but their food has remained consistently good. About a year ago they started offering taquitos, which are nothing more than small tacos (hence, the name), similar to what you find throughout Mexico. Since I usually order regular tacos, sopes or tortas there, I’ve avoided the taquitos. 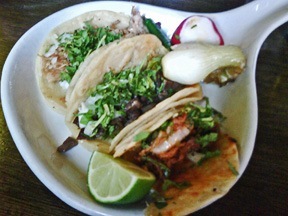 But on Tuesday this week, I decided to order three taquitos – carnitas, al pastor, and cecina. Wow, I was surprised at how good they were. In fact, they may have been the best tacos I’ve ever had there. And keep in mind, I’ve had, literally, hundreds of tacos from this place. Most importantly, the tortillas were perfect. I know they don’t hand make their tortillas, but they do “housemade” them. In other words, this place always have fresh tortillas because they make them there and you can see them running off their conveyor belt. These small tortillas were more tender, and more toothsome than I ever remember their tortillas being. They were slightly thicker and cooked to perfection on the griddle with a little oil to give them tender flavor and texture. And the fillings were done perfectly. Their al pastor, which has never been their strong suit, was well flavored and slightly charred – a nice touch since they don’t use a spit. Their carnitas, always their best choice, was perfectly tender, moist and flavorful without any hint dryness. And yet, it wasn’t overly rich either. And the cecina taco was good too, though not as memorable as the other two. So, while Los Gemelos isn’t new by any stretch, it’s good to know that some places are still producing great Mexican food, seven years on.